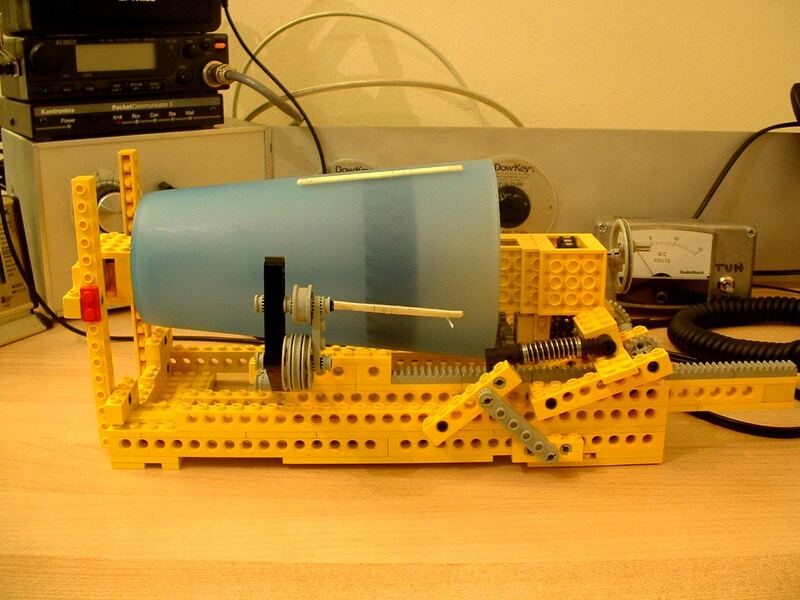 This page is for antennas and antenna accessories that don't get a full writeup, at least yet. First up is the VHF antenna stack that I built for the June VHF QSO Party 2006. 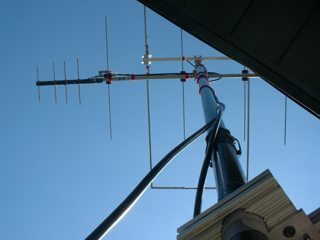 It required an additional clamp on the balcony mast. 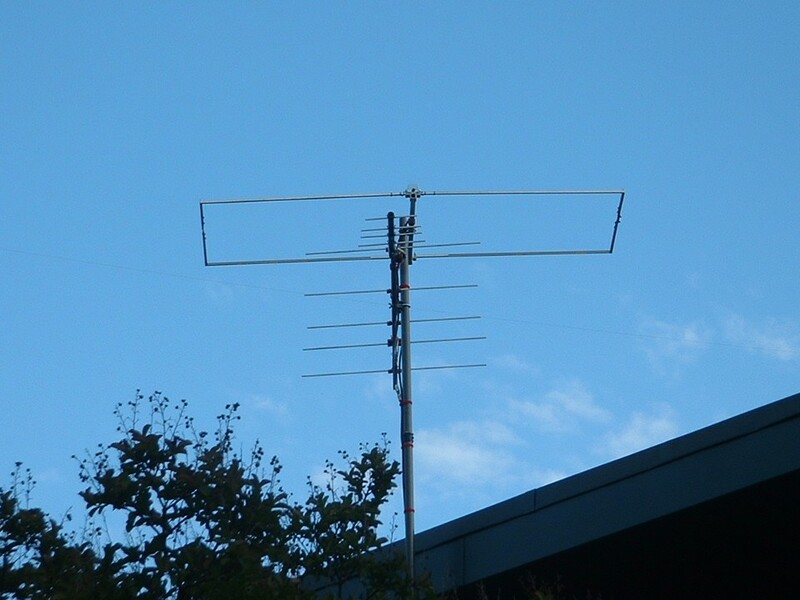 The antennas are the six meter Moxon, a 2m five element yagi and a 4 element 435MHz yagi, which has decent SWR and pattern at 432 as well. The antennas were designed with QuickYagi by WA7RAI and tweaked in EZNEC for best pattern. The 2m boom is 80/20 from McMaster Carr and makes it easy to set the element spacing, and to do some empirical tweaking if necessary. The separation of the 435 MHz yagi from the 2m yagi was set for maximum front-to-back of the 435MHz unit. 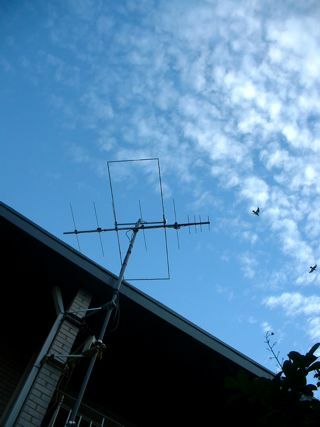 The 2m yagi doesn't even notice the presence of the 70cm antenna. There are two runs of coax, one for the 50MHz Moxon and one for the 2m/70cm antenna, split by an MFJ diplexer mounted on the boom. I have about 2dB of measured line loss on 435MHz. The array clears the roof by about 4 feet. In this shot you can see the extra stainless mast bracket. 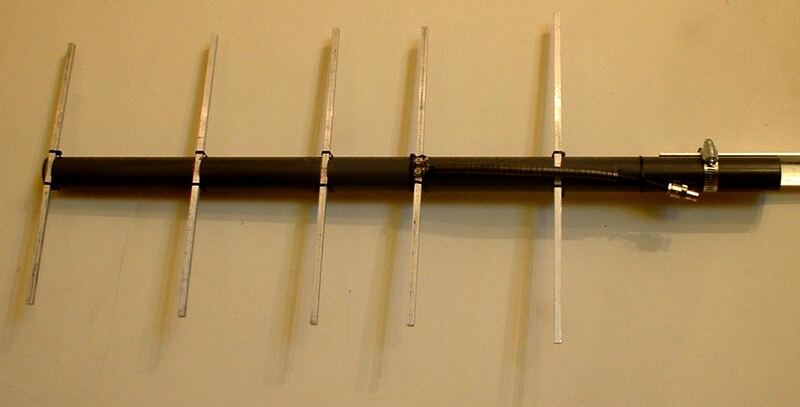 Here's a 5 element yagi for 440MHz. I designed it using Quickyagi by WA7RAI. I used a milling machine to cut the slots in the boom. Not so practical for home use but you could just use some square nonconductive stuff and strap 'em on. A bead balun made of FT-50-43 toroids over coax keeps currents off the coax shield. I usually use this one mounted on a tripod on the balcony. I won't include details, just download the program (or your favorite yagi designer) and make one for yourself. Mine's got 10dB gain, about 20dB F/B ratio. 440MHz yagi with 1/4" square elements and PVC boom. 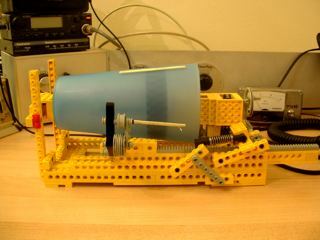 My Lego® wire winder for a drinking glass wire launching spool. The small black arm sticking upward in the foreground is the wire guide, and it's attached to the long gear rack. A pinion driven through a couple of stages of gear reduction drives the rack from the wide end of the glass to the narrow end as the glass rotates. The crank visible to the right in the above picture is what I'm currently using to drive the glass rotation. I played with the gear reduction to wind a good tight pitch to spool on as much wire as possible without (much) overlap. The left end support for the glass is removable to get the glass out; the red blocks remind me where to put it back. The "shock absorber" spring part has two uses: the pinion does not fit otherwise, the spring allows it to sit in a proper meshed position, and additionally, the pinion can be lifted off the rack for a fast reset of the wire guide arm. Another view of the Lego® wire spooler showing more of the gears. The winder works pretty well. I have an adapter to hold the glass on the end of a microphone stand while launching the wire, and now I can wind the glass full of 100ft of wire in just a couple of minutes. The winder does not tolerate much tension on the wire, so I first wind it off the normal spool onto an old bicycle wheel. 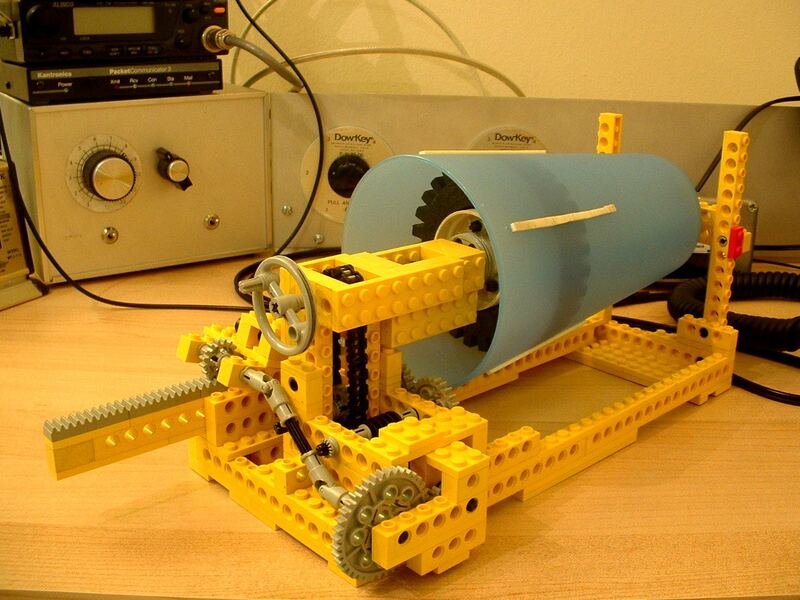 The wheel turns very freely with even a tiny amount of tension, and as such, I can turn the crank quite fast. Some overlap is inevitable when going fast, but it seems that it's not really a problem when spooling out the wire, as long as it doesn't cross back over more than about two turns.